For the 24 hours to 23:00 GMT, the GBP rose 0.20% against the USD and closed at 1.2750. In the Asian session, at GMT0400, the pair is trading at 1.2730, with the GBP trading 0.16% lower against the USD from yesterday’s close. 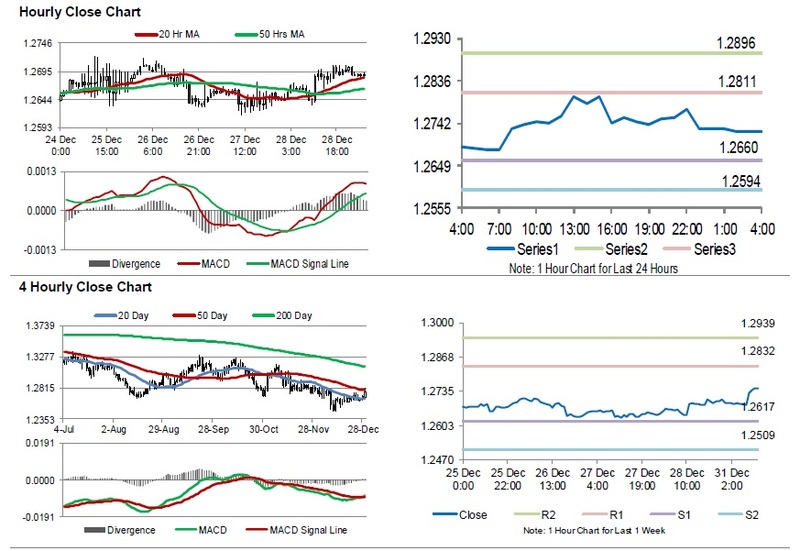 The pair is expected to find support at 1.2663, and a fall through could take it to the next support level of 1.2596. The pair is expected to find its first resistance at 1.2814, and a rise through could take it to the next resistance level of 1.2898. Looking ahead, investor would closely monitor UK’s Markit manufacturing PMI for December, due in a few fours. This entry was posted in GBP/USD. Bookmark the permalink.